Has the romantic charm of your gas fireplace cooled off? Has the crackle of the flames (okay, gas fireplaces sort of hiss) lost their je ne sais quoi? Have we found the fireplace for you. 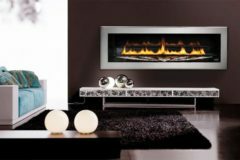 The LHD50SS direct-vent gas fireplace by Napoleon includes an elaborate necklace of cut crystals made by Swarovski, internationally renowned producer of precision-cut crystals for the jewelry and fashion marketplace. A “regular” Napoleon LDH50 fireplace with standard 50-by-16-inch glass viewing area retails for $4,329. Adding the Swarovski sparkle ups the price to $10,499, and $12,599 for a see-through unit. If the cost of that bling is a bit much for you, but you’re still yearning for an exceptional fireplace experience, check out our slideshow of fireplaces to get some ideas. This entry was posted on Thursday, June 1st, 2017 at 9:15 am	and is filed under Random Thoughts. You can follow any responses to this entry through the RSS 2.0 feed. Both comments and pings are currently closed.